This is my brother Daniel...also known as Connor. He just graduated high school, and will beginning college this fall. On July 29th, he finally had enough money to buy a newer car, after saving his money as well as selling his cherished red Camaro, that he loved very much, but he needed something more reliable during the winter. It was really difficult for him to sell first car, but then yesterday, he found a used car that he loved. He purchased the SUV off of a man living in Detroit, who our family found on Craigslist. We of course checked out the VIN #, looked over the title that the guy had, and overall everything matched up great. My brother paid for this car with $2500 cash. That was his only mistake. Because there is no easy way to get cash back. They tried transferring the title into his name today at the SOS, but it turns out that their was an error that wouldn’t allow them to do this. After doing some digging around, and with the help of our neighbor who is a police officer, it turns out the car was indeed a stolen car. 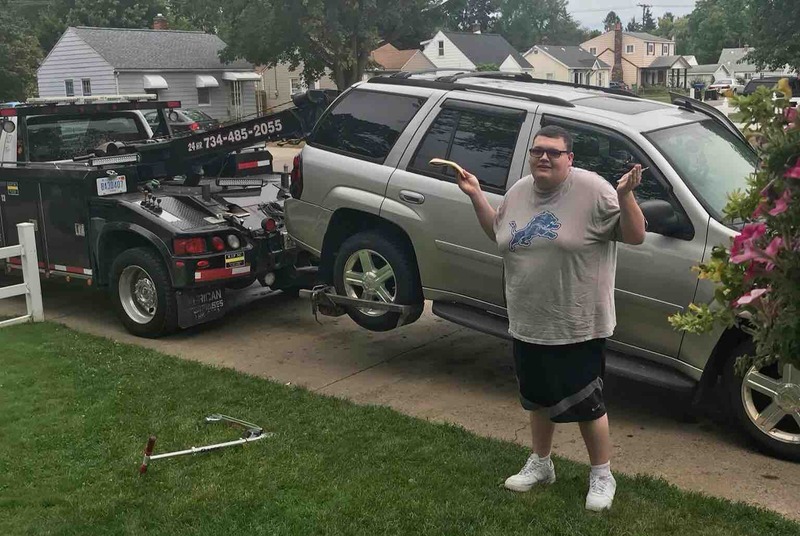 Connor called the police who had it towed away, and at this point we are being told the chances of Connor getting his money back...0%. The police or trying to find the guy who stole it, and it’s looking like this isn’t the first car he’s sold that ended up stolen. He is somehow getting REAL titles, and making everything match up like it’s just another person selling their used car. Connor is heartbroken over this, and realistically we all know he wanted toCry when this happened, but he held it together. He spent all he had saved though, on this car, and now has NO car and NO money. Several people on Facebook have asked us to create a gofundme, so I decided to start one for him. If you can help contribute to helping him buy another car, that’s would be great. We will keep this page updated with any new information, and if they catch the guy. The police have a full description of the guy, phone number, and address. Thank you everyone for your support and help. No more info regarding investigation with the man who lied and stole Connors money. cover whatever else Connors needs for a decent used car. The money raised on here is extremely helpful, and we can’t thank everyone enough! Thank you again, for all of the donations so far. The cops are still looking for the guy who stole Connors money. Connor is working and saving his money again, and really appreciates everyone’s help by sharing and donating. If anything more is found out, we will update and let everyone know. Everyone’s working hard to figure out what happened, but Sals auto in Detroit definitely seems to be connected somehow to allowing this to happen. Insurance is also investigating what’s going on, but I would highly recommend that everyone stays clear of Sals Auto, not only because they were very unkind to the situation that happened, but also because we have reason to believe they were connected with the man who lied and stole Connors money. Will update with more information when we learn more. Thank you! Thank you for all the support by sharing Connors story, and donating to it. I think this will help Connor see that there are good in people, and not just bad, like the person who stole his money. Connor was on the news at 4, and will be on again at 6!